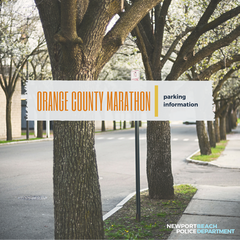 The Orange County Marathon will be held tomorrow (Sunday, May 6). Starting at 12:00 a.m. Sunday morning, the race course will be checked for vehicles in the posted temporary no parking areas. Any vehicles left along the course will be cited and towed. Please park your vehicles in a legal parking space on Saturday, prior to midnight. Corona del Mar residents are allowed to park in the CDM Main Beach Parking Lot overnight. Payment requirements will end at 5:00 p.m. on Saturday and begin again at 10:00 a.m. on Sunday.